Hello Kitty: It's About Time - The Review! Hello Kitty: It’s About Time features original, full-color adventures of Hello Kitty having beach parties, dance contests, birthday gifts, and time machines. Hello Kitty also journeys inside of a Coo-coo clock to unite two lovers. This book shows Hello Kitty and her companions having a blast. Fans of all ages will truly enjoy flipping through this book – albeit briefly since the adventures go on only for a few pages and the book itself is only 62 pages of speechless illustrations. Since Hello Kitty is silent – I can’t tell you much about the stories; you need to create her thoughts for yourself; however, I can tell you the basic details of her adventures without spoiling them. In this title you will find Hello Kitty in an interesting variety of situations.I’ll list them briefly without spoilers. Beach Party – In this, our feline friend goes to the beach. The Race – Hello Kitty and friends participate in a race. Who wins!? Read to find out. Ahead of the Game – This one is about trying on space helmets. Speed Bike Race – Our favorite characters go on a Tron-like adventure. House Music – a one page story about dancing. It is drawn in a style of animation that doesn’t quite match the rest of the book. Let’s Dance – This one is about a friendly dance competition between friends. Mix Tape – Explore different time periods with a cassette player… er time machine? This is one of the longer adventures. Wednesday – Another one page story, drawn in the same style has House Music. Sweet Treats – This adventure is about baking sweet treats…. and finding a tree that grows them! Cuckoo Clock – Watch our favorite feline and friends unite two love birds. All Day Long – Another one page story, this one is about a slow day. Birthday Surprise – Hello Kitty plans out a birthday for her friend. I don’t particularly care for Erica Salcedo’s artwork or stories. I appreciate the variety her work adds to the book, but I just can’t love the way she drew the characters. There are a few stories in this book to absolutely adore, such as Mix Tape and Cuckoo Clock. You are sure to find a few adventures in this little book that you’ll love just as much. Since this book is relatively wordless, you can share it with little ones and they’ll enjoy it just as much. You may have to show them what a cassette and cassette player are; however. It might have made more sense if Jorge Monlongo depicted our favorite kitty with an MP3 player instead, but as an older fan of Hello Kitty I really do appreciate seeing her with a portable cassette player. If you do plan to purchase this, please be aware that Ahead of the Game features a misprint; unfortunately. The next story starts on the following page, cutting off this adventure. A few pages later you will find the last page of Ahead of the Game. I am hoping this is not a defect with the entire print-run. 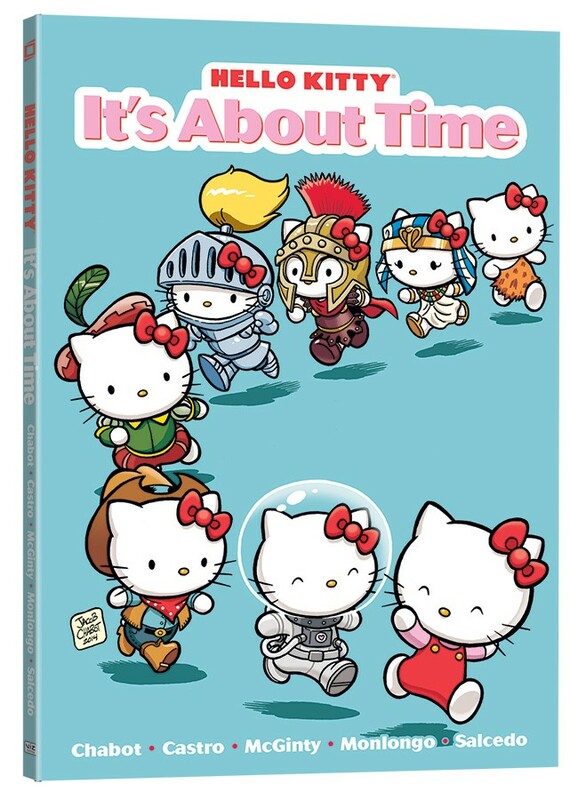 I would suggest this as a purchase for any fan of Hello Kitty once the defects are weeded out by the publisher.